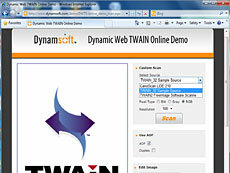 Dynamic Web TWAIN is a true web scanning solution specifically designed for your web applications. It enables you to acquire images from any TWAIN compatible devices and upload the scanned images to web servers. It went through the rigorous evaluation of Lockheed Martin, and now is deployed on their 400+ servers. Coding Service is provided. In this service, the only thing you need to do is telling us what you want. Our developers will write the real code for you. Both ActiveX and Plug-In are supported. Compatible with Internet Explorer, Mozilla, NetScape, FireFox and many other browsers. The ActiveX is digitally signed by VeriSign. Multi acquired images can be buffered, viewed and managed locally before being uploaded to web server. Easy to distribute: absolutely no supporting DLL is needed for distributing. Provides an Image Editor for image editing and viewing. Supports basic image editing features including Rotate, Crop, Mirror, Flip and ChangeImageSize. Supports BMP, JPEG, PNG, TIFF image formats. Supports RLE, G3, G4, LZW, PackBits TIFF compression. Strong internet support: downloading and uploading image through HTTP or FTP. Supports multi-page TIFF upload without any local file operation. Marked safe for initializing and scripting. Can be deployed in .NET environment as an unmanaged control. Supports Native, Buffered Memory and Disk File image transfer modes. Both single page and multi-page TIFF are supported. Built-in wizard mode manages the states of the TWAIN session intelligently and makes the Dynamic Web TWAIN easy to use. Built-in JPEG, PNG and TIFF encoder enables you to compress the acquired image no matter whether the TWAIN source has the capability. Supports auto document feeder (ADF) and multiple images acquisition. Can set and read common device features through properties, such as: IfAutoFeed, IfAutoScan, Resolution, BitDepth, Brightness, Contrast, Unit, Duplex and so on.